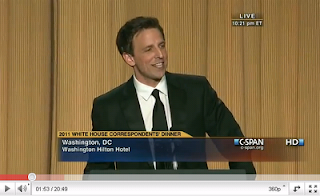 For your reading pleasure, here's the transcript of Seth Meyers' speech at the White House Correspondents' Dinner 2011. Hello, I'm Seth Meyers and I cannot thank you enough for having me tonight. Let me just say up top that this evening I'm going to be making a lot of jokes about many of the people in this room, but don't worry, I assure you no matter how harsh the jokes they have all been vetted by the man at the top, Chinese President Hu Jin Tao. Truthfully, I'm humbled to be sitting at a table with President Obama, a man I greatly admire. It's such an honor to perform for the leader of the world's most powerful/poorest country. And before I start, these were my birth certificate jokes [holds up papers] - so thank you for the timing on that, Mr. President. Now unusable. We were working on these jokes for months - one of my guys said, "Are you worried we're a little heavy on birth certificate jokes; what if he releases it before the dinner?" And I was like, "Why would he do that?! He's not going to wait three years and then release it before the dinner." Who told you I had birth certificate jokes?! It was Assange, wasn't it? Is Biden still Vice-President? Because if not I'm down to like "thank you and God Bless America." Now I can begin - I am also honored to be performing for those of you here tonight, as well as the handful of people watching at home on CSPAN. CSPAN is of course the official network for wide-shots of empty chairs. Every time I tune into CSPAN it looks like they just had a fire drill. CSPAN is one unpaid electric bill away from being a radio station. People think Bin Laden is hiding in the Hindu Kush, but did you know that every day from four to five he hosts a show on CSPAN? I'm not complaining about CSPAN mind you; I usually work on NBC so tonight I'm thrilled to be on a network that people actually watch. In fact, the fact that I'm projected on four screens right now makes me the third highest-rated show on NBC. Comcast of course bought NBC this year - I'm assuming by accident. Or when Goldman Sachs cut up the network and bundled it in the lower tranche of a CDO... I figured this was the only room where that joke would work and it only kind of did. It won't be joining me on the road. It's so amazing to be in Washington, D.C. - all this history, all these amazing buildings - and yet here we are at the Hilton. The red carpet outside was amazing. "Who are you wearing?" "What does it matter, I'm going into a Hilton." Don't get me wrong, I'm very happy that we're at the Hilton, because no matter how I do tonight I'm earning Hilton Honors Points. You may not like these jokes, but I'll be laughing all the way to a free breakfast. For those of you who don't know, the White House Correspondents' Association is an organization of journalists who cover both the White House and the President, although earlier Senator John Kyle told me that 90% of what they do is abortions. But tonight is not about our political differences, tonight is really about the after parties. I keep hearing how everyone is excited to go to the Bloomberg party. You know how I know I'm not in New York? In New York, no one is excited to go to a Bloomberg party. In New York, a Bloomberg party is five people smoking outside a bar complaining about Bloomberg. I am of course contractually obligated to attend the MSNBC party tonight. Everyone knows how the MSNBC party works - President Obama makes the Cool Aid and everyone there drinks it. Too close to my home?There are actually some unscheduled parties happening tonight and I've been asked to give everyone a rundown. Fox News is having a party - security is tough so make sure and bring your driver's license and your long-form driver's license. But if you're blonde, don't worry about it - just bring that dynamite smile. The New York Times party used to be free, but tonight there's a cover, so like everyone else I'll probably just go to the Huffington Post party. And the Huffington Post party is asking people to go to other parties first and just steal food and drinks and bring it from there. Don't get me wrong, I love Arriana Huffington - especially her voice. She sounds like a woman who would be sitting up in bed with a sheet wrapped around her as James Bond is walking out the door - "Will I see you again James?" Andrew Breitbart's after party is going to be crazy - I mean it won't be good, but it will be crazy. Side note - I actually met James O'Keefe last night. At least I think it was James O'Keefe - it may have just been a regular pimp who hated organized labor. NPR is having a party, but I'm sure it will be pretty sedate. How wild can a party get when it's held in accordance with Sharia Law? It's what I was told. Katie is just one of the many departures we've seen this year. NPR fired Juan Williams after he said Muslims make him nervous. So Juan is black and afraid of Muslims, which making him the least likely man to get a cab in New York City. MSNBC's Keith Olbermann was suspended from his show for violating company policy by donating money to three Democratic campaigns - still, the punishment seemed rather harsh compared to the slap on the wrist Larry King got after giving a Buffalo nickel to the campaign of Chester A. Arthur. CNN replaced Larry King with Pierce Morgan this year just like the old expression, "Out with the old, in with the who?" Rick Sanchez, you are gone, but you are forgotten. Not everyone is leaving, my friend Anderson Cooper is still over at CNN and I especially love watching him report from the field. You can always tell how much danger Anderson Cooper is in by how tight his clothing is. If he's in the bulky yellow slicker, then it's a Hurricane that's still off-shore. If he's in the khaki vest, he's maybe in the Green Zone in Baghdad. But when he's in the child-sized white t-shirt, bullets are flying, he's getting punched, he's pulling kittens out of the rubble. So what I'm saying is, if you ever see Anderson Cooper with his shirt off, turn off your television and run. MSNBC has a new slogan this year - "lean forward", as if the problem has been that we couldn't hear them. Lean forward. Have you seen Hardball? Chris Matthews yells like an auctioneer in a wind-tunnel. I've never watched Hardball and thought "I need to get a little closer to this." Now more than ever it's clear that media is changing. New outlets are adopting to an online world. Even Bloomberg News is on twitter, with an impressive 220,000 followers; so only 20,000 less than a cobra that escaped from the Bronx zoo. My friend and colleague from NBC Brian Williams is here tonight. Brian said he was coming because tonight has the element he most respects in an evening - cameras. I'm not saying Brian loves being on TV, but when he went to Egypt it was because he heard it was their pilot season. All joking aside, I have nothing but respect for my good friend Brian; I don't know if everyone heard about this, but Brian landed in London to cover the royal wedding, only to turn around and return to America to cover the tornadoes in Alabama. It was incredibly brave and courageous. And that is a direct quote from Brian Williams. This event tonight has grown past Washington and many Hollywood celebrities are also here tonight. John Hamm is here - yeah. John Hamm looks the way every republican think they look. Zach Galifianakis is also here. Zach Galifianakis looks the way republicans think every democrat looks. Since we're talking about celebrities and reality stars, we might as well talk about the 2012 republican candidates. Just look at the options the republicans are kicking around - Palin, Huckabee, Gingrich, Trump. That doesn't sound like a field of candidates. That sounds like Season 13 of Dancing with the Stars. And not the stars, the dancers. Let's start with Mitt Romney. Mitt Romney wrote a book titled "No Apologies." No apologies? When you have to proclaim "no apologies", isn't that a tacit admission you've made a lot of mistakes? If I come home from a trip to Vegas and the first thing I say to my girlfriend is "no apologies", we're going to have a follow-up conversation. Both Rand Paul and Ron Paul have been talking about a run in 2012, so they have something in common with my father and I, which is we're also not going to get elected president. I of course would love nothing more than to see a debate between a father and son. Rebuttal: Dad, you ruin everything! Tim Palenty is considering a run. If you look up boring in the dictionary, that's more exciting than listening to Tim Palenty. Tim Palenty makes Al Gore look like Ru Paul. Mike Huckabee is considering a run. Mike Huckabee said the President was raised in Kenya, went to a Muslim school and hates America, but despite that he still seems like a sweet person. So he sounds less like a presidential candidate and more like my aunt. And then of course there's Donald Trump. Donald Trump has been saying he will run for president as a republican, which is surprising since I just assumed he was running as a joke. Donald Trump often appears on Fox, which is ironic because a fox often appears on Donald Trump's head. If you're at the Washington Post table with Trump and you can't finish your entree, don't worry - the fox will eat it. And if I can for a moment talk about the birther issue - when did we get so suspicious about where people were born? A USA Today poll last week said 38% of Americans think the President was definitely born in the US. In the same poll - in the very same poll - only 5% more said Donald Trump was definitely born in the US. Has it reached the point where Americans only think someone was born here if they saw it? I know I was born here, and I know my younger brother was born here, but when it comes to my older brother, I can only take him at his word. Gary Busey said recently that Donald Trump would make a great president. Of course he said the same thing about an old rusty bird cage that he found. Donald Trump owns the Miss USA pageant, which is great for republicans since it will streamline their search for a vice-president. Donald Trump said recently he has a great relationship with the blacks, but unless the Blacks are a family of white people I bet he is mistaken. I like that Trump is filthy rich, but nobody told his accent. His whole life is models and gold leaf and marble columns, but he still sounds like a know-it-all down at the OTB. Mr. Trump may not be a good choice for president, but he would definitely make a great press secretary. How much fun would that be? "Kim Jun Il is a loser - his latest rally was a flop. I feel bad for Ahmadinejad - the man wears a wind breaker, he has no class. I on the other hand sell my own line of ties. You can find them at Macy's in the flammable section." So it's not a strong field, and who knows if they can beat you in 2012. But I tell you who could definitely beat you Mr. President. 2008 Barack Obama. You would have loved him. So charismatic; so charming. Was he a little too idealistic? Maybe. But you would have loved him. I still think we all remember that inauguration day - the first lady was there. And may I say for as beautiful as you looked that day, you look even more beautiful tonight. Now, you on the other hand, Mr. President, have aged a little. What happend to you? When you were sworn in you looked like the guy from the Old Spice commercials. Now you look like Louis Gossett, Sr. I have never said this to anyone before, but maybe you should start smoking again. Is this the change you were talking about? Mr. President, look at your hair. If your hair gets any whiter the Tea Party is going to endorse it. Ooohh, I'm going to get an angry voice mail from Jenny Thomas in 19 years. But I believe the President would agree with me that the mood has changed a bit since the beginning of his term. At the beginning of his term, Mr. President, house wives were trying to sneak into the White House. Not anymore; now everyone's leaving. Axelrod, Gibbs, Rahm Emmanuel. By this time next year it will just be you and Joe Biden trying to find toner for the copy machine. And now your reelection campaign has begun. I bet it's hard getting back into campaign mode again. You know who's really dreading it? Wil.i.am. He's writing down words that rhyme with debt-ceiling. The Heritage Foundation projected that joke would get a standing ovation. Probably shouldn't trust those guys. But Mr. President, I truly still have confidence in you. For one you still have the first lady. And of course you still have Joe Biden. What can I say about Joe Biden that hasn't already been said incorrectly by Joe Biden? I imagine having Joe Biden as vice-president is kind of like taking your blue-collar dad to a fancy restaurant. He's more comfortable at the Olive Garden. He talks a little too loud, he mis-pronounces the sauces, and you're always tempted to lean over to the waiter and say "I'm sorry about him, he's from Scranton." The President and Joe Biden were not invited to the royal wedding and when Biden found out he immediately said to the President: "You, me, Wedding Crashers 2. I'll book us two Amtrak tickets to London." The Vice-President loves the trains. And I assume it must have been hard for the President to tell Biden the new budget cut $1.5 billion from high speed rail. "Joe, come on in, take off your engineer's cap. I have some bad news about the choo-choos." As he broke the news, one of the straps on Joe's overalls, sadly drooped off his shoulder. On the subject of budgets, I would be remiss not to mention Paul Ryan. Paul Ryan introduced a budget plan that would overhaul Medicare and make deep cuts to other social and healthcare programs because he believes the American people have said loud and clear: "Stop using my tax dollars to take care of me." I noticed that his approach to the budget led many to praise Paul Ryan as a serious adult. And I have to say nothing is more depressing about politics than the fact that adult is now a compliment. Adult is only a compliment to a child. "I'm so proud of you, you acted like an adult tonight. I'm glad I brought you to my bosses' house for dinner. You even cut your own meat like a big boy." Also Congress, there are a lot of things that you want us to be impressed by that we are not impressed by. We are not impressed that you sat next to each other at the State of the Union. You know what the rest of Americans call an evening spent sitting next to another person with wildly different political views? Thanksgiving. We're not impressed when you complained about how bills are too long to read. The Health Care bill is almost 2000 pages good. A bill that insures every person in America should be longer than The Girl with the Dragon Tattoo. Also while we're at it, I don't think you read bills anyways. I think you guys vote on bills in the same way the rest of us agree to updated terms and conditions on iTunes. Well I should wrap it up - I'm getting the red light. Not the red light that signals I'm out of time, but the red light that signals the CSPAN handicam is running low on batteries. In all seriousness I want to thank all the journalists here tonight - I couldn't do my job if you didn't do yours. And it's fitting that this event happened on the same weekend as the royal wedding because as I was watching the festivities, I couldn't help thinking how wonderful it is to live in a country where people don't wear hats like that. Tonight has truly been an incredible honor for me. America is the greatest country on Earth, and at least when my speech started was still a nation that was rated AAA by Standard & Poors.